I owe you an apology. I don't know what I was thinking, all I can say in mitigation is that many of these are often written very early in the morning due to chronic insomnia and I may have been a little befuddled and it snowballed from there. 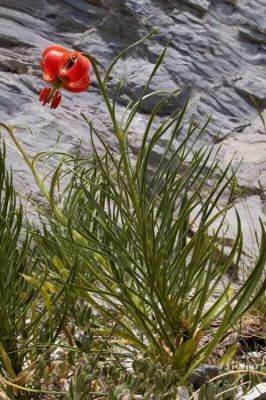 My crime: to mislead you, dear reader, into thinking that Fritillaria acmopetala looks alarmingly like F. kurdica v. taylish. Okay, it's not that alarming like seeing the ghost of your dead great aunt at the bottom of the bed, especially alarming as you never met her, but it was just wrong and those journalistic standards do not befit an online diary (the word "blog" is surpassed in its emetic qualities by "blogosphere". Anyway, the plant masquerading as F. acmopetala was actually F. latakiensis. It still looks suspiciously like taylish, and the form wendelboi, below, is still acmopetala wendelboi. 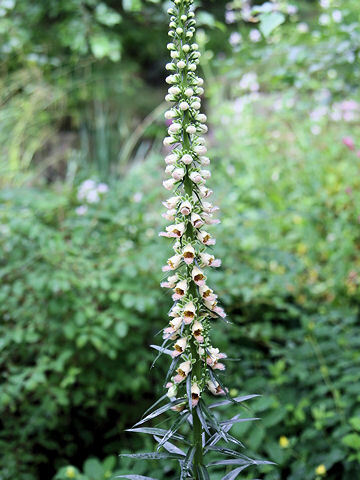 This bloom has the wider, more bell-shaped form of acmopetala rather than the slimline latakiensis (below). Feel free to wonder whether I know what I'm doing. Actually, this has always been an experiment, call it a reality website, happening in real time, with real numpties making real mistakes! The rest of the Frits got some rain today, thank god, because while I do get the hose out as regularly as possible I have to be incredibly careful not to blast pot of delicate seeds and seedlings so it's a tedious and difficult job (you've seen how crowded it is up here and if you haven't look at the previous post) which involves clambering in and out of the window and up and down the spiral staircase (changing in and out of muddy trainers at each time. I recently bought one of those spray gun fittings to try to create more of a sprinkler effect but it just doesn't work. I was in the Incredibly Expensive Garden Centre today and almost bought more of shower head style fitting but it was £25.99 and the same make as the trigger one I already have so I don't see why one would work and the other not. Incidentally, this really is Fritillaria acmopetala. It still has some way to go before we see it in its full glory. And remember when I told you F. persica grows like Japanese Knotweed once it gets going? It's now twice the height it was five days ago when we last had a little look at it. I'm afraid the picture, in common with most of the pix in this post, was taken with considerable haste between a rain shower and darkness. The flower buds are forming nicely and I think this is going to be quite a stunner. Please forgive the spikey green hairstyle, it's a bearded iris (and they'd better get a shift on; I keep feeling for that tell-tale bulge within the folds of the leaves that indicate a nascent flower spike). On the rest of the Frits: quite a few are not going to flower this years, preferring to build up strength with leaves and my tomato food. Pontica and Pallidiflora are going to bloom; carica had managed a single leaf but at least it's alive, making rather more leaf are pyrenaica, affinis, camschatcensis, kotschyana. So out of all my purchases, only one, montana, failed to make it through the winter. 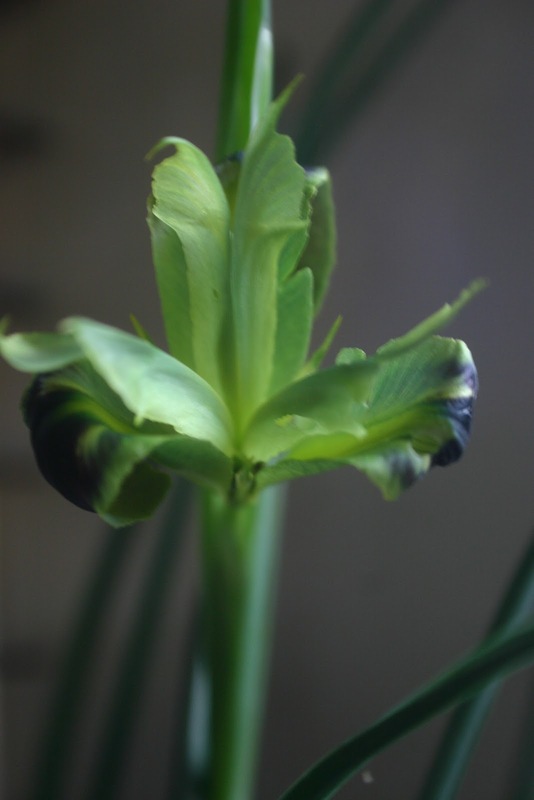 As I was showing off my Iris orchiodes last post I mentioned that Iris magnifica was also coming along? Well it played the same trick on me as orchiodes and crept up on me, opening overnight, the tinker! 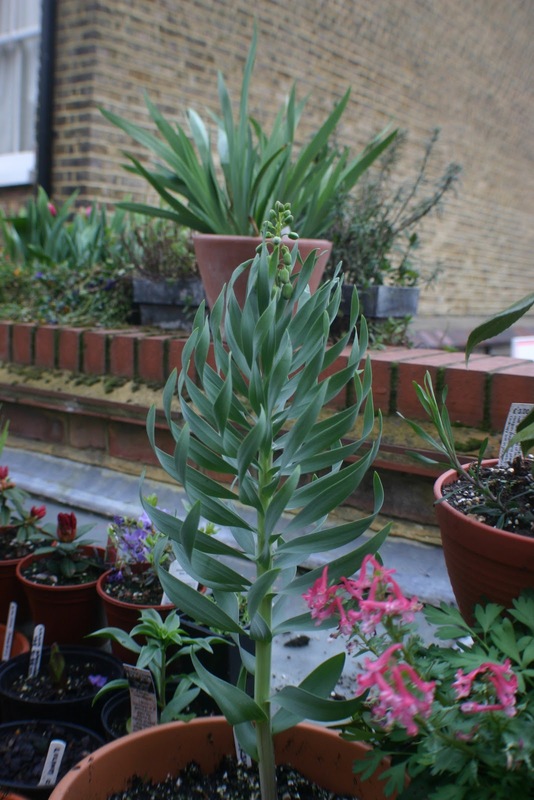 It has about a dozen flower buds, stretching almost all the way down the stem but the bulb is sitting too high in its pot, meaning the weight of the bloom has caused the whole plant to list alarmingly. It's not a disaster, I can strap it up but it spoils the aesthetics a bit! The first of many. Unfortunately rarely at the same time. Nice greenfly! This really is the angle at which it's sitting. That was nice, wasn't it? Well, now proof that the pictures in the bulb catalogues of huge pots are actually made up of the pick of loads of single bulbs raised individually and blooming as if as one: I bring you my pot of Iris bucharica, all planted at the same time and therefore all subjected to the same conditions. I don't normally grow my junos on top of the DVD player, by the way, it just provided a good background in a hurry. I could have cropped out the the TV aerial but this is real reportage, brought to you from the frontline of pretty flowers! It's Iris bucharica, the easiest of the bunch (in the UK anyway) and the most likely to do well in the rockery or a big trough (but careful: if it's anything other than clinically depressed it will bulk up like a small group of rabbits who have run out of condoms. It may be common among the Iris massive but bucharica is still rarely grown by other gardeners which is a shame because it is a robust plant and, at close quarters, really rather stunning. Neither of these were even proper buds this morning, although it has been a sunny and windy day. And, while we're on the subject, Hermodactylus tuberosus had already been moved to the "Nice try but have some food and water and I expect a bit more effort next spring" area along with Crocus sativus and various Iris reticulatas. I was checking on the unpronouncable South African bulb seedlings, all of which are doing brilliantly, even the Moraea ciliata cotyledon that keeps getting mown by a slug (I go out at night with a torch and throw them into the schoolyard in the hope they eat the vocal cords of the under-10s, or at least restrict the higher-pitched screams) when the most amazing sight caught my eye. I've never seen Hermodactylus (there is only one species, although it may actually have reverted to its previous monicker, Iris tuberosa, although it will probably have reverted to Hermodactylus by the time you read this) in the flesh but it was the most arresting sight, I almost dropped the pot of Lachanalia viridiflora seedlings I was inspecting. My second was: "God, I hope the camera battery's charged and I must get this in before an asteroid falls on it". My third was :"They even feel like velvet. And don't you get a nice quality of light in the bathroom". And my fourth was: "Must get these on twitpic and Facebook so everyone thinks I'm the world's best gardener and a passable photographer. Might as well have a piss while I'm here". For bigger seeds such as Nasturtium I'd stick with the age-old dibber because they need to be 1.5cm deep and grit would provide too dry an environment with only a little of the seed touching the life-giving compost. Grit's ideal for medium-sized seeds such as Geranium, allowing you to sow the seed evenly and cover with a single layer of the tiny stones, so the seed doesn't have much work to do to head for the light. It also makes seedlings easy to spot but a world of warning: MAKE SURE THE GRIT HAS A NEUTRAL pH! You don't want to sow Azaleas and cover them with limestone. For teeny seed such as Meconopsis, my usual method is to mix it with sand, make a paper chute (fairy cake cases are ideal) and tap the mixture evenly over the surface, that way you can see where you've been and get good coverage. Water by immersion lest you make a pig's arse of it all, charging in with the watering can. Well, that was boring but I can now boast the very recent germination of, as well as a plethora of South African bulb seedlings, Lathyrus aureus (one man's gold is another man's brown and yellow), Iris orientalis (syn. ochroleuca), Iris attica, Iris sibirica hybrids, the white form of Iris pseudacorus, Alstroemeria "Ligtu" hybrids; Digitalis obscura, Digitalis viridiflora, Digitalis thapsi, Digitalis nervosa, Digitalis trojana (I kicked over the pot and although I'd tried to put Humpty together again I managed to find a plant on the Web, So now I have enought to kill all my friends' children). I'm not sure the slugs could be bothered to climb up this rockface. That's what I'll do! Build a cliff on the roof! Still, I think a few will pull through; there are dozens of the Delphium that cam from Chilterns named helpfully as "unknown" but which apparently has turquoise flowers. There's a primula that I can't even guess at. I Had thought it might be alpicola until I saw the pot of alpicolas. I don't remember ordering any others except mixed auriculas but the emergent true leaves on these are definitely of the crinkly vulgaris type rather than smooth edged or farinose, ruling out auriculas and anything like secundiflora or chionantha. I must remember to keep checking in the greenhouse where I think 100% (that's 10 seeds btw) of Gladioli flanganni have happily reached a couple of inches and Oxalis squamata (I forget the collection number) from Chile. 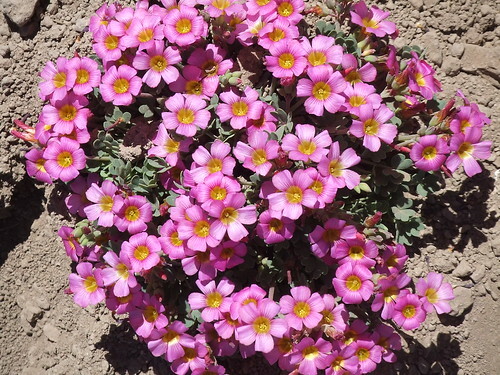 It's a shame I can't build a rockery on the roof to accommodate plants like this Chilean Oxalis squamata. 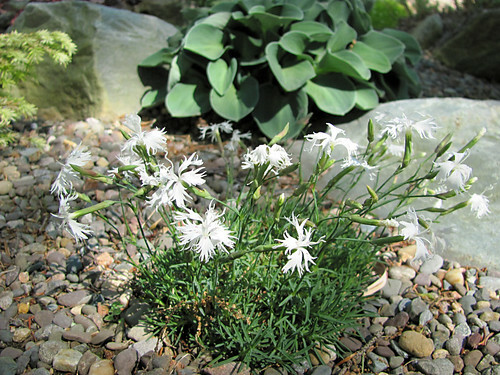 There are so many stunning and easy specimens that would make great garden plants. Check out Chileflora.com, enter a common genus such as the above, and you will be amazed at what's out there and totally unknown except locally and academically. Also shooting up arethe blue Lathyrus sativus v. azureus which really are growing more than a centimetre a day despite being sown in some emergency compost made up of the grindings of a barely dead tree, grit, vermiculite and the shakings from a bag of John Innes 2. Still, they're either very happy or desperately trying to escape from the root trainers I've got them in. While we're climbing, that Nasturtium I was raving about a few weeks ago, Tropaeolum "Caribbean Crush", a strain with very pale pastel shades has started to germinate. Madly, considering there were only eight seeds in the packet (and there were only meant to be six) I decided to have a go at scarification, where one takes a knife and makes the merest of nicks in the seedcoat. It is not for the faint-hearted, shakey of hand or amateur. So quite why I was doing it flip knows but I can see from the safety of indoors that at least two have germinated and I can't see the other pots so I think we're looking at a success here. (I ventured outside later, once the banshees had gone back to class and I counted six). There was also one incredibly thin and spindly T. tricolor which had germinated out in the open. I couldn't find the rest but as I was feeling a bit sick I could't be bothered. It must be that fragile (I'm talking as thin as the thinnest needle in the pack) naturally as it has full access to sunlight etc. It must be used to putting everything into height to jostle for position in the canopy. I hope it's not too annoyed when it discovers I don't have one. While at the garden centre I gave in to temptation and bought a packet of bold magenta Nasturtiums. It is an extraordinary shade for a flower; like a white shirt soaked in beetroot juice. I can't think of anywhere else I've seen it in the plant world, not even among the gaudiest dwarf Azaleas. "Princess Anne". Leaves have a reddish tinge. Like its namesake's face. Oh, I've had a couple of significant deliveries through the week: my 10 species or ancient hybrid Pelargoniums arrived right at the end of March, as promised, although I still feel slightly nervous putting them out but there's no alternative. The other delivery was from Sir Paul of his Rare Plants nursery: Lilium (you'd think I'd know by now) sempervivoideum not to be confused with sempervivium), Bomarea hirtella and cyrtanhus flanaganii. 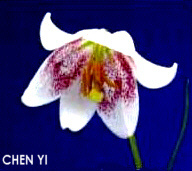 It's not the most immediately stunning lily but has the benefit of rarity and un-growability. Paul says: "This rare Chinese species makes stems 20-40cm tall clothed with quite narrow leaves. If cultivation is correct, then this stem will be topped with 1-2 flowers. These are flaring and white to pale pink, with a central patch of purple-red (in the manner of Erythronium hendersonii!). There is also some purple spotting around the centre. 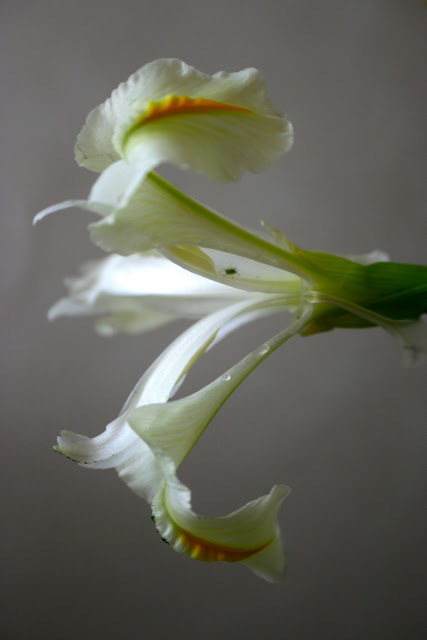 "Thrilling and lovely this has only rarely been in cultivation. It is a little intemperate, but not un-growable. It adores cool humidity in summer and that, along with an open, fibrous, well-drained, moisture retentive compost is the key to success. It also likes a dryish winter." He doesn't say what correct cultivation involves so I'll just treat it like all my lilies: mix of orchid compost, general purpose compost, perlite, grit and food granules. I might manage the winter cover bit, if I remember. I would have ended with a shot of the Clematis tower where Jacqeline due Pré is a sight for sore eyes, arses and toes. But it's dark now and of course the wind has finally dropped. I'll get it tomorrow. Probably. Enjoy the weekend and get out there to see what's been happening. You'll be surprised!